Beti Kristof is Feeling L’Vegue. Beti is feeling L’Vegue in Las Vegas. And she should. 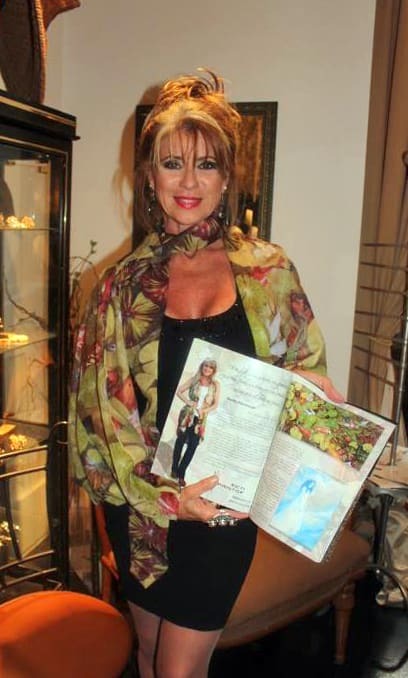 Artist Beti Kristof is featured in the current issue of L’Vegue, Las Vergas’ premier fashion magazine. Beti Kristof is L-Vegue from Beti kristof on Vimeo. Click here to read the whole issue. Creativity isn’t always easy. Often, Beti is approached to do challenging projects. One of her latest painting commissions is for a mother who had recently lost her young daughter to an aggressive cancer. Beti herself has a son who is a cancer survivor, which has lead her to share her talents with St. Jude Children’s Research Hospital. These experiences help her draw from a deeper compassion and understanding, specifically looking for that something extra that makes a delicate portrait so special, memorable and personal. 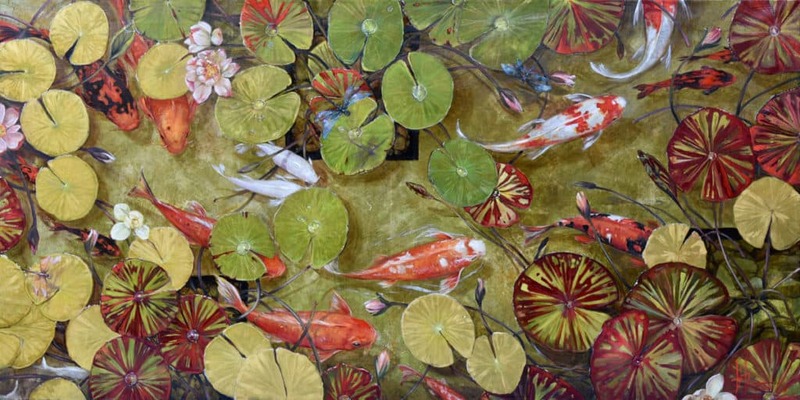 Her current series of Zen Koi artworks are an impressive collection of beautifully rendered epic paintings. Her recent visits to the Getty Villa in Malibu inspired her to create these newest masterworks. From her first in the series, she was immediately hooked. Beti shares that the amazing magic of her creative process is that you never know where it might lead. Her Koi paintings have inspired an impressive new line of fabrics for outdoor furniture, pillows and draperies – and of course fashion. Throughout the ages the term “artist” was given as a true level of achievement in the discipline of art studies. 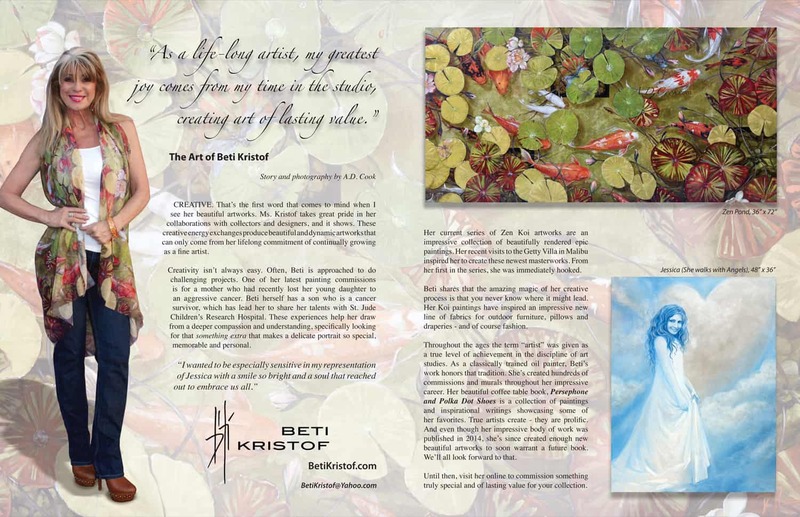 As a classically trained oil painter, Beti’s work honors that tradition. She’s created hundreds of commissions and murals throughout her impressive career. Her beautiful coffee table book, Persephone and Polka Dot Shoes is a collection of paintings and inspirational writings showcasing some of her favorites. True artists create – they are prolific. And even though her impressive body of work was published in 2014, she’s since created enough new beautiful artworks to soon warrant a future book. We’ll all look forward to that. Until then, visit her online to commission something truly special and of lasting value for your collection. Click here to read Beti’s story and the entire L’Vegue Magazine One Year Anniversary Edition. Special thanks to L’Vegue magazine of Las Vegas. David Tupaz, Editor-In-Chief, and Tony Ferriera, Publisher, are rockin’ Las Vegue if true style. Cheers to your success!